This is the featured community in the major commercial film hit "Beasts of the Southern Wild". Could be used in a discussion of a specific impacts of climate change that are happening NOW in the US. Slideshow might have a greater impact on students if shown on a projector with blog posts printed out for students so they could stop at certain points and read the blog. Following the readings and slideshow, show the four-minute film "Can't Stop the Water." The Isle de Jean Charles, located in the Gulf Coast near Louisiana, has been undergoing major changes as it copes with climate change. The land is sinking and the water is rising, leaving many areas accessible only by boat. Produced by Louisiana's Public Broadcasting group, the succinct slides share Native tribes' perspectives as they cope with the changes. Comments from expert scientist: This study provides a slideshow discussing the impacts of rising sea levels on life in coastal Louisiana. It focuses on the lives of Native Americans under rising sea levels and its main link is to a story by PBS News Hour on the same topic. It presents good general information on the topics but does not get into details of why sea level is rising except in general terms. It is mainly focused on the history of the area and the personal experience of the people who live there rather than details about the science of global warming or coastal subsidence. 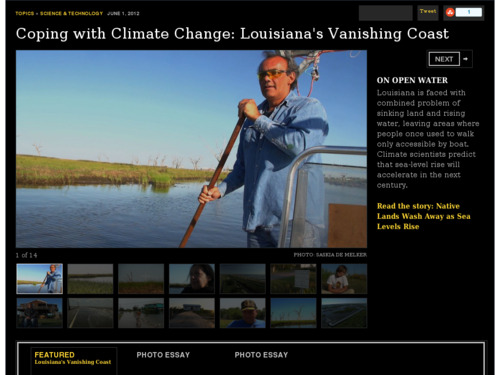 Slideshow is in story format and includes links for educators to read more about each slide by providing links to the full story [link http://www.pbs.org/newshour/updates/climate-change-jan-june12-louisianac... and the film, "Can't Stop the Water" [link http://www.isledejeancharles.com/media]. Slideshow can be shown on desktop or projected, the latter of which would have greater impact. Photos are clear and of good quality.